Allison's two-page sketches are my favorite. 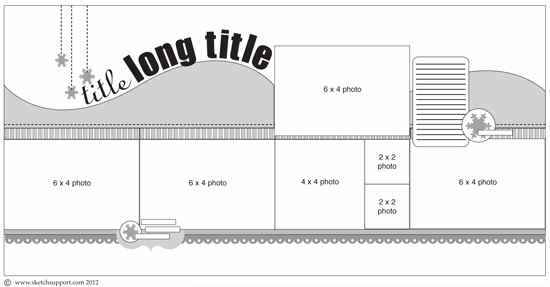 I love having the design work done for me, especially when I want to showcase multiple photos on a layout. Her sketches are so easy to adapt to whatever I have! I really like the sketch as it is, so my alterations were minor. Since my photos are colorful and bold, I decided to go with more muted colors for my paper. Cosmo Cricket's Odds & Ends fill the bill, with a vintage feel suitable for my Greenfield Village winter scenes. 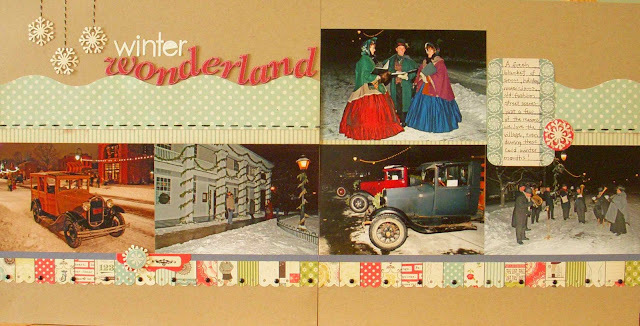 I just love the old-fashioned cars and the dresses those carolers are wearing! Several members of the Sketch Support Creative Team adapted this sketch to single page layouts, which you can see here. Great variety from one sketch! I'd love it if you would find the icon in my sidebar and click the little "Like" button. Many thanks to those who have already done this! Now that's a proper Victorian Christmas! I love that border you made along the bottom - I shall have to remember that idea. That sketch is very reminiscent of Shimelle's 4X6 Photo Love LO for May last year with five photos. Oh, I love this... the way wonderland follows the curve, the hanging snow flakes at the top, and the fun scalloped border across the bottom! And wow to those photos!!! Love those little scallop strips on the bottom with the brads. A beautiful border that supports the photos. Looks like a sketch that could be used again and again. TFS! It's beautiful love the suspended snow flakes and gorgeous photos - beautiful. I used this sketch this week as the starting point for a layout - I added more photos so it turned out different in the end. Love this layout. I really love the snowflakes and the title. Great job. Those photos are great! I love the way you did the title. Snowflakes...love them. Love the Cosmo Cricket! Nice two-pager! 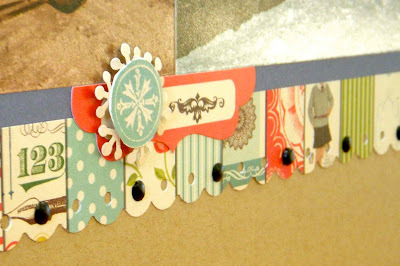 Love the scalloped border...and the pics are wonderful! I LOVE your wonderland title! Awesome layout! good job on the sketch...your layout came out beautiful. Love how you changed it up a little for you. And the photos are just amazing! Wonderful layouts. That border is really sweet, great way to use up some papers! 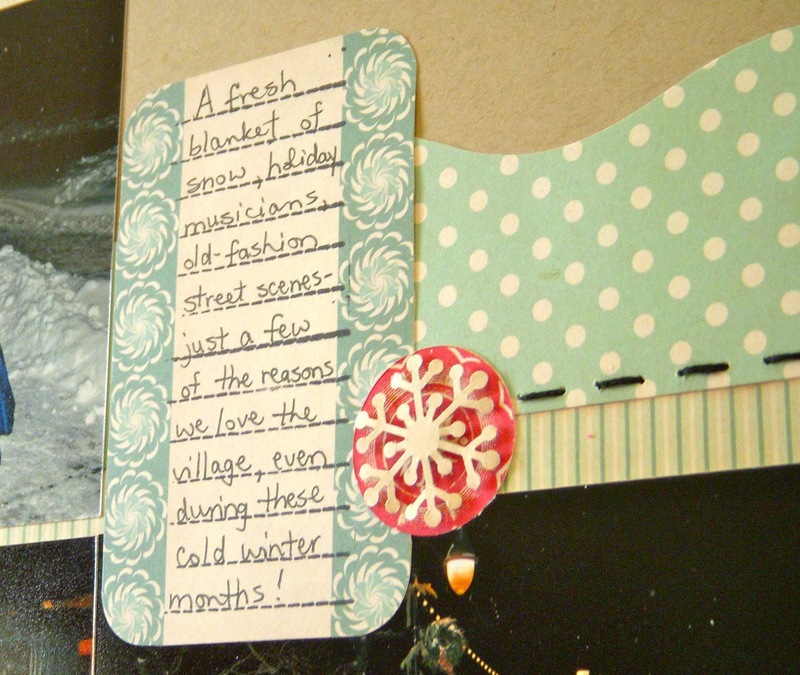 I will have to scraplift that idea! Lovely job on the sketch. I just love your photos! Great job! Do you mind if I pin this layout on pinterest? I have Sketch support sketches pinned but this is a fabulous example of what you can do with them. I love the border and would like to save it to my boards. I love those scallopy tabs at the bottom, so fun! LOVE everything about this. The title is so fun, the border treatment is awesome, the photos are fabulous. I love the hanging snowflakes. This is a great 2-pager, Sue!